OAT real-time enabled SAP ERP and SAP AII for a Pharmaceutical Manufacturer to provide Real-Time Serialized Container Tracking of Class II Pharmaceuticals, automatically generating Advance Ship Notices (ASNs) and error-proofing product delivery across multiple manufacturing facilities. Reusable containers (also known as reusable transport items or "RTIs") are ubiquitous in manufacturing and distribution operations. 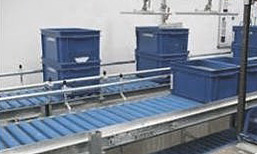 From small plastic totes to larger steel roll cages to shipping pallets, RTIs are an essential component in the flow of materials and products within and between facilities. They readily enable the movement of raw materials, subassemblies, small parts, bulk items, finished goods, and more. Manufacturers and distributors typically maintain large "pools" or collections of RTIs in order to meet their material movement needs, and the benefits of doing so are clear – having RTIs available when and where needed is essential to a well-functioning supply chain. But along with the benefit of these containers comes the costs – purchasing, maintaining, cleaning, storing, inventorying, even just tracking the location of RTIs. By their very nature, these RTIs are moving between facilities, where they may be stored or misplaced for weeks or months. Shipping error rates between 1 and 3% and annual asset shrinkage rates of 10% are the industry norm. Manual RTI tracking is often among the weakest links in a manufacturer's supply chain. As RTIs move from facility to facility, they are increasingly likely to be misplaced, often creating a disruption in operations, leading to increased labor, inventory and expedite costs. With OAT RTI Tracking, enterprises can gain an accurate, real-time view into the location and state of their RTIs. With a simple Auto-ID-based solution, manufacturers can know precisely where their RTIs are located, reducing the need for buying, maintaining, and storing excess containers. Configurable alerts can notify personnel when RTI inventory levels are too low, prompting corrective action before a costly error occurs.